I suppose it is misleading to call this a reinvention. In all reality after almost five years my blog finally has an identity!! I have always been a little bothered by the fact that I couldn't pin down any one "topic" to write about way back when I started, and over the years I have often felt like it could use a little focus. I was very hesitant to just change it all up after so long, but after the idea for A Well-Feathered Nest came to me, it just seemed to grow in my heart, and so I wanted to go for it and share my passion with you all. On the outside it may look like my blog just got a name and a new look, but on my inside I am so excited about the focus it has given me. 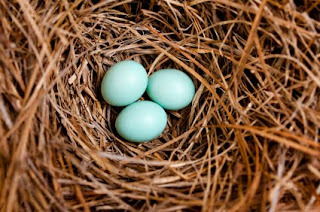 I don't even remember where I came across the photo or words or whatever it was that sparked my idea, but the idea of a well-feathered nest says so much about who I am, what I do, and what I want to share with the world. My day to day job is to create a home that nurtures our family--that nourishes each of us physically, mentally, and spiritually. I want it to be a home that teaches my children to love, to appreciate beauty, and to overflow in wisdom and service to Christ. There are so many ways that I seek to do that, and so that's what I'll be sharing here with the world. Great name. I hope you have even more success in the next 5 years. Calm and peaceful - two things I love. Thanks so much for the feedback! I definitely like calm and peaceful as well. If only I could keep my house that way!